The Lipstick Building (also known as 53rd at Third) is a 453-foot (138 meter) tall skyscraper located at 885 Third Avenue, between East 53rd Street and 54th Street, across from the Citigroup Center in Manhattan, New York City, United States. It was completed in 1986 and has 34 floors. The building was designed by John Burgee Architects with Philip Johnson. The building receives its name from its shape and color, which resembles a tube of lipstick. The company that owned the building, Metropolitan 885 Third Avenue LLC, filed for bankruptcy in 2010 after overpaying for the property. At three levels the Lipstick Building's wall is set back in response to Manhattan's zoning regulation, which requires the building to recede from the street within its spatial envelope, to increase the availability of light at street level. The result is a form that looks as though it could retract telescopically, though the floor plates are tangential to one another at the rear of the site, at the party wall. The shape, which is unusual in comparison to surrounding buildings, uses less space at the base than a regular skyscraper of quadrilateral footprint would use. This provides more room for the heavy pedestrian traffic along Third Avenue. At the base, the building stands on columns which act as an entrance for a vast post-modern hall. They are two stories high and separate the street from the nine-meter (30 ft) high lobby. Because the elevators and emergency staircases are located to the rear of the building, this area appears hollow. The exterior of the building is a continuous wall of red Imperial granite and stainless steel. The ribbon windows are surrounded by gray frames. In between floors is a thin red band which recalls the red color of lipstick. The curvatures of the building allows light to reflect off the polished stone and stainless surfaces. The building's architects, John Burgee and Philip Johnson, moved their firm there in 1986. In 1991, the two ended their partnership and Johnson moved into a smaller space in the building. Bernard L. Madoff Investment Securities leased the 17th through 19th floors. Madoff operated his $65 billion Ponzi scheme from the 17th floor, which was occupied by no more than 24 employees. In 2011, an art exhibition occupied the 14th and 15th floors of the building. Participating artists not only brought in their own works and materials, but also used the extant structures and forgotten possessions of the last tenants to engage the workplace. The location is now identified as the name building for its largest tenant, international law firm Latham & Watkins. In April 2013, the law firm LeClairRyan consolidated its two New York City offices on the 16th floor. ^ a b Goldberger, Paul (January 27, 2005). "Philip Johnson, Architecture's Restless Intellect, Dies at 98". The New York Times. Retrieved March 13, 2010. ^ Henriques, Diana B.; Berenson, Alex (December 14, 2008). "The 17th Floor, Where Wealth Went to Vanish". The New York Times. Retrieved March 13, 2010. ^ Glovin, David; Larson, Erik; Levitt, David M. (July 3, 2009). "Marshals Arrive, Ruth Madoff Leaves as Manhattan Home Is Seized". Bloomberg.com. Retrieved March 13, 2010. ^ Quinlan, Adriane (July 15, 2011). "The Cubicle Is a Canvas at a Midtown Art Show". City Room. Retrieved 2011-07-31. ^ "Lipstick Building lands new financial tenant". Real Estate Weekly. April 8, 2015. Retrieved February 7, 2016. ^ Delaporte, Gus (May 16, 2014). "Law Firm Suites Signs Sublease at 830 Third Avenue". Commercial Observer. Retrieved February 7, 2016. 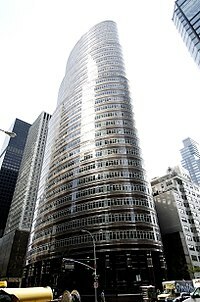 Wikimedia Commons has media related to Lipstick Building.